Culturally we learn things visually. We are taught to write things down to reinforce them in our brain but this can lead to our lacking well-developed audio storage in our head. We need both, particularly as musicians. Where is this going? To your tongue, of course! Joe has a theory that in many cases we have built up a false image in our head about the limitations of our tongue. It is an amazing muscle and we need to realize that and create an image in our mind about what it can do. A guitar player can see his fingers and watch other peoples' as well. Harp players lack that visual reinforcement, but rest assured, you can get your tongue to do amazing things on the harp if you believe in it! Joe's quick exercise to prove this? Try singing tra-la-la-la-la quickly, like in a Christmas song. Of course you can do it, and that is all tongue action. Now you need to translate that ability into your harp playing! It's here! This Sunday! See you there! 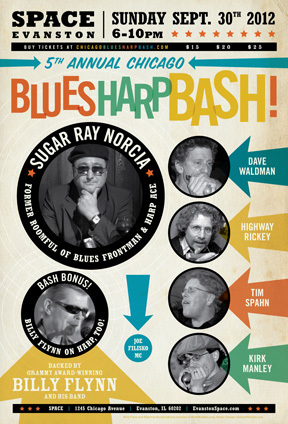 Sugar Ray Norcia will be the special guest in B1 on October 1! Announcing the next class recital - December 15 at the Harlem Avenue Lounge. Begin working on your material now and as Joe says, he wants to hear your performance repertoire. Play pieces you perform well. Sugar Ray Norcia In B1!!! As if catching Sugar Ray headlining the Bash Sunday is not enough, come catch him in B1 next Monday night, October 1 to hear him play up close and personal and ask him questions. We'll have the long-lost, official class mascot Big Jim Themelis in class that night too, so it will be a special one not to miss!